From getting back to nature with a tent, some matches, and a few liters of bottled water, to enjoying a pub dinner and camping out in the garden afterwards, this book shows how to get hooked on wild camping in all its forms. Beautiful wildernesses; tiny budgets; environmentally-friendly . . . What’s not to like? - what is wild camping and why bother? The bulk of the book (80 percent) features the best places to go in England, Wales, Ireland, and Scotland, along with stories and tips from experienced wild campers (how to make a fire, how to filter water) and simple recipes for foraged food. With helpful maps and inspiring photos, this guide will give readers the knowledge and the inspiration to escape the noise, clutter, and stress of day-to-day life and go wild. 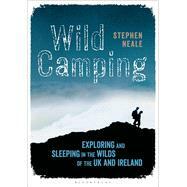 Stephen Neale is a journalist and writer, and the author of Bloomsbury's Camping by the Waterside. He set up the popular camponwater.com website, is the editor of Outdoor Focus (the magazine for the Outdoor Writers and Photographers Guild) and spends most of his spare time outdoors navigating rivers, setting up camp with his family in the wilderness, and writing about how amazing England is.